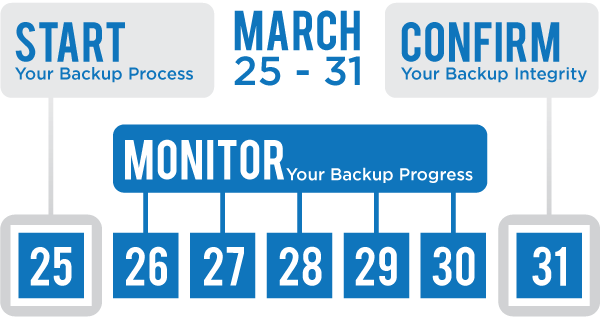 Backup Awareness Week launched on March 25th and runs through March 31st. Participants include major backup software providers Acronis®, Arq™, Carbonite®, KeepVault®, MyDataAnywhere™, SOS Online Backup®, and SpiderOak®. Backup Week is a community-oriented event promoting awareness about the importance of regularly backing up your files. The website offers discounts on local and online backup software and a quick-start guide to help people get started with backup. TROY, Mich. - March 27, 2014 - PRLog -- KeepVault announced today that Backup Awareness Week has seen industry-wide support. According to KeepVault CEO David Smith, visitors have been flocking to backupweek.com to take advantage of discounts from popular backup providers. The focus of Backup Awareness Week is to promote data backup awareness and answer questions related to data backup. In addition industry-wide support, Backup Week has been embraced by the online social community, seeing traction on Twitter and Hacker News. @nimblelight’s tweets “A haiku: I have collected, so many puppy photos, oh no where'd they go -- backupweek.com #backupweek”. Feedback from a “Show HN: Backup Awareness Week” on Hacker News was generally positive as well, generating exchange of peer-to-peer advice and valuable feedback about the event. Backup Awareness Week is a community initiative launched by KeepVault™. Our mission is to educate the public about the risks of data loss, and ways to protect their data. In light of the need for social awareness on these issues, Backup Awareness Week welcomes participation of individuals, communities, organizations, media, and other backup providers.